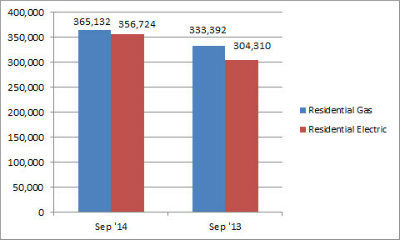 U.S. shipments of residential gas storage water heaters for September 2014 increased 9.5 percent, to 365,132 units, up from 333,392 units shipped in September 2013. Residential electric storage water heater shipments increased 17.2 percent in September 2014, to 356,724 units, up from 304,310 units shipped in September 2013. For the year-to-date, U.S. shipments of residential gas storage water heaters increased 3.5 percent, to 3,279,008, compared to 3,169,378 units shipped during the same period in 2013. 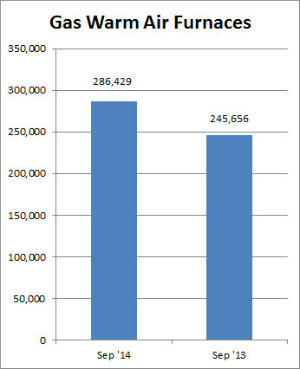 Residential electric storage water heater shipments increased 5.4 percent year-to-date, to 3,130,659 units, compared to 2,970,038 units shipped during the same period in 2013. Commercial gas storage water heater shipments increased 19.9 percent in September 2014, to 7,729 units, up from 6,448 units shipped in September 2013. Commercial electric storage water heater shipments increased 10.4 percent in September 2014, to 6,060 units, up from 5,489 units shipped in September 2013. Year-to-date U.S. shipments of commercial gas storage water heaters increased 5.9 percent, to 71,375 units, compared with 67,408 units shipped during the same period in 2013. Year-to-date commercial electric storage water heater shipments increased 7.9 percent to 55,478 units, up from 51,437 units shipped during the same period in 2013. U.S. shipments of gas warm air furnaces for September 2014 increased 16.6 percent, to 286,429 units, up from 245,656 units shipped in September 2013. 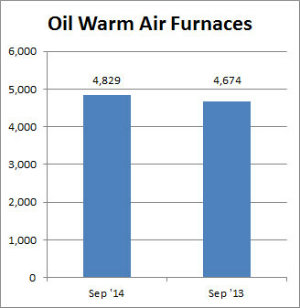 Oil warm air furnace shipments increased 3.3 percent, to 4,829 units in September 2014, up from 4,674 units shipped in September 2013. Year-to-date U.S. shipments of gas warm air furnaces increased 4.9 percent, to 1,918,179 units, compared with 1,829,082 units shipped during the same period in 2013. Year-to-date U.S. shipments of oil warm air furnaces increased 5.9 percent to 21,879, compared with 20,657 units shipped during the same period in 2013. 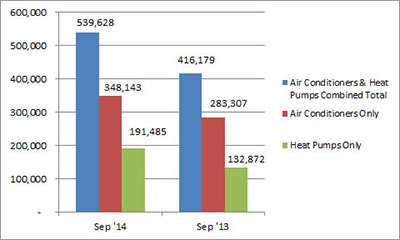 U.S. shipments of central air conditioners and air-source heat pumps totaled 539,628 units in September 2014, up 29.7 percent from 416,179 units shipped in September 2013. U.S. shipments of air conditioners increased 22.9 percent, to 348,143 units, up from 283,307 units shipped in September 2013. U.S. shipments of air-source heat pumps increased 44.1 percent, to 191,485 units, up from 132,872 units shipped in September 2013. 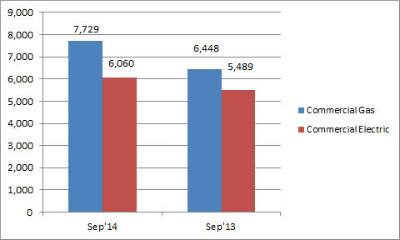 Year-to-date combined shipments of central air conditioners and air-source heat pumps increased 8.2 percent, to 5,599,693 units, up from 5,176,909 units shipped in September 2013. Year-to-date shipments of central air conditioners increased 4.2 percent, to 3,713,244 units, up from 3,563,835 units shipped during the same period in 2013. The year-to-date total for heat pump shipments increased 16.9 percent, to 1,886,449 units, up from 1,613,074 units shipped during the same period in 2013.